The Munster U/13 to U/19 Indoor Championships will be held in Nenagh Indoor Stadium on February 24th and 25th. 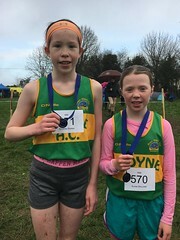 The following athletes have been entered: Cormac Burke, Aaron McLaughlin, Tara Gleeson, Louise Hickey, Dylan McLaughlin, Shannon Boland, Katie Bergin, Jack Hickey, Seán Burke and Michael O’ Mahony. We wish them the very best of luck in these championships.